Dave’s work has an amazing perk: four cabins in various spots on the West Coast. We were able to get the cabin in Carmel for the last week of August. It was a great opportunity to relax. 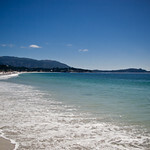 The first day we were there, we just chilled and walked around Carmel-by-the-Sea. We checked out the incredibly beautiful beach. In the evening, we grilled dinner at the cabin.